Why love matters - Vietnamese monk Thich Nhat Hanh has an amazing insight to share! What is love? It means different things to different people. When a mother loves her child, have you noticed that the mother's love doesn't change with time or place or even when a child does not reciprocate it? Perhaps there is none of the ''my happiness', 'my priority', 'my desires' sort of mentality in the relationship. There is an element of being desireless, in the sense, that the mother wants no material or physical gain from the relationship. The mother may have big dreams of her child becoming X,Y and Z but not necessarily to materially benefit from this. Being itself is enough. 'Being a Mother' is tinged with a sense of happiness despite all the daily struggles and challenges that it brings. Typically a mother is so engrossed and involved in raising her child, without a sense of a separation of the Self. In a sense, everything else ceases to matter. That kind of love doesn't change from a mother's side. Love has to be experienced first, right? The famous Vietnamese monk Thich Nhat Hanh has a beautiful teaching around what love truly means. It will change your understanding of 'love' in a narrow sense. 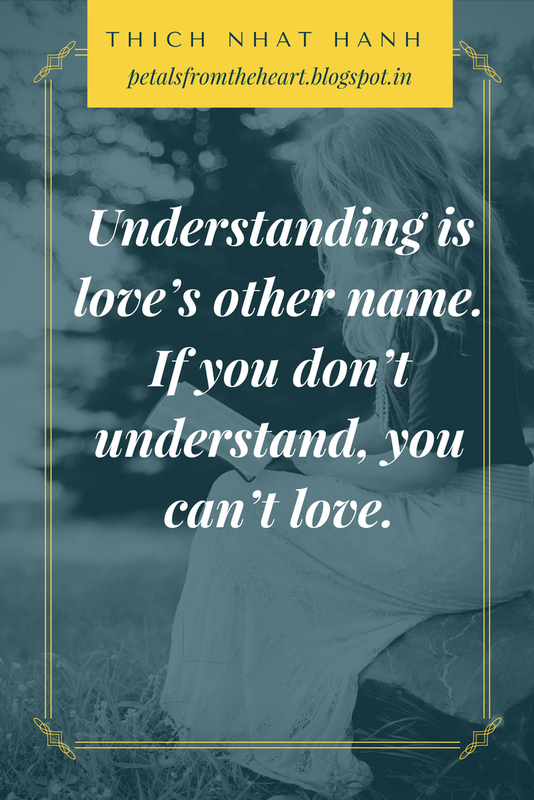 According to him, "Understanding is love's other name." There is a treasury of meaning to that simple yet profound statement. When we understand, we stop judging. When we understand, we stop expecting. When we understand, we accept with grace. When we understand, there is nothing left to create a sense of separation. Have you thought about love differently now? I'd love to hear your views. A very different take on love but so true and powerful at the same time. If we can judge less and understand more, the world would be a better place. Each day we have so many opportunities to understand people, circumstances, tragedies and more yet usually we resort to condemning, judging or pointing fingers. Thanks Vishnu, I am happy to hear that your thoughts are in sync with mine esp when it comes to judging others. We waste so much time on wasteful thoughts and activities that these get played up in our actions because we are constantly judging others and criticizing them in our minds. So much to improve in ourselves first but my oh my, we don't have time for that!